Another Mega Man manga series is getting delayed? Oh, lord. I'm shocked. Well thats a shame but all well thats life for ya. Sure do hope Udon picks those up and brings them to the states. That would be pretty interesting. It'd be nice if they decided to translate and release the Mega Man X manga as well. 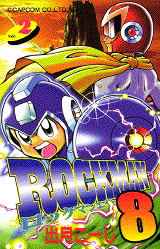 Did the Rockman 8 manga ever get a proper volume 3 release in Japan? Nope, there wasn't anything after the second volume, despite the tease for a third book. Just ended with the Search Man chapter. I'm not totally sure, but I believe part of it had to do with Izuki and the Moon Up crew forging ahead with the Rockman and Forte books. At least X4 did get that re-release addition of two more chapters to add the Double and General fights. It originally ended before that, even.